I read that you were born in Singapore and your family travelled around a lot. Would you tell us which countries you lived in and what impact they had on you? I was born in Singapore. My dad was in the RAF and stationed there at the time so I did travel regularly as he would be given a new posting roughly every three or four years. I was only 18 months old when we moved back to the UK, so I don’t remember any of it, and after that we stayed within the UK – still moving every three or so years – thus unfortunately I didn’t manage to see the world and it wasn’t quite as glamorous as it sounds. I do have memories of some especially beautiful places in the UK, though, such as the Malvern Hills on the border of England and Wales. I spent a few rose-coloured halcyon summers wandering those hills. Inadvertently the travelling every few years thing probably did impact on me becoming a writer, or at the very least, an avid reader. It is quite hard to make lasting friendships when you’re picking up and moving every few years, so books became my best friends and travelling companions. I started writing in 2002. Back then I was working as a lecturer at Brighton University. My daughter Harriett is profoundly disabled and around that time she went through a prolonged period of poor health, so I made the decision to step out of teaching and help my wife in caring full time for her. I suddenly found myself at home pretty much 24/7, and after a while thought a hobby might be a positive thing, one I could pursue from home. My wife and boys suggested I try my hand at writing. I didn’t think I’d be very good, but thought I might as well have a go. That was when I began writing Malice. 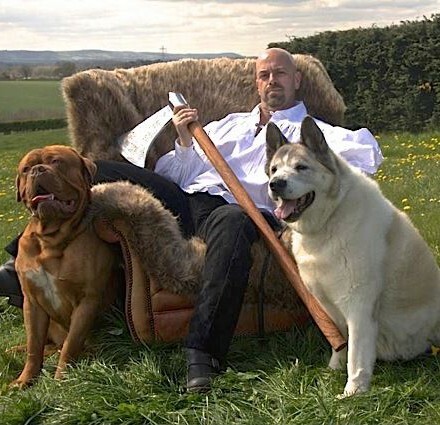 You have one of the best author profile photos I’ve ever seen. What’s the story behind it? Really that came about as a bit of fun. I am only a small cog in part of a mad and fun-loving family. We regularly go to historic events, Medieval Days and festivals and my boys have always enjoyed dressing up for them. When my agent and publisher asked for a photo my boys said it was my turn to dress up! 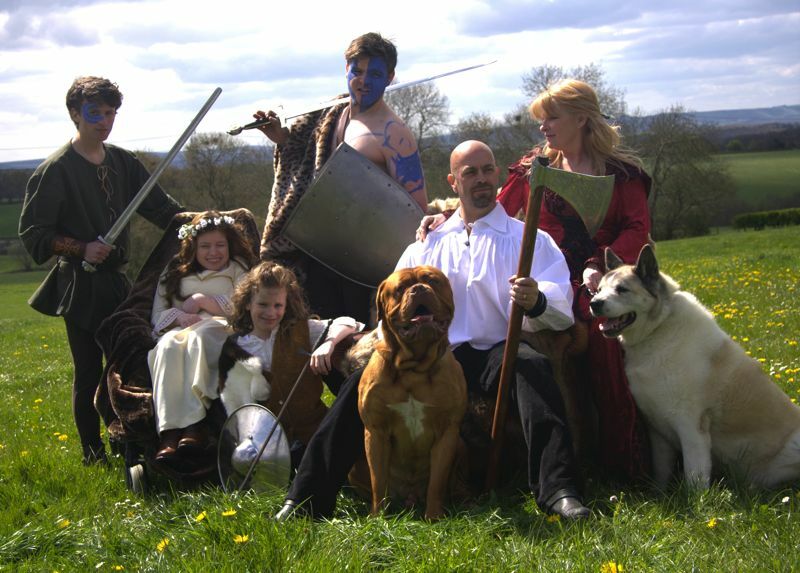 Here’s a shot of Clan Gwynne, dogs and all! Is your family supportive of your writing? Do they read your books? And without Caroline my wife I’m sure me being a writer wouldn’t have happened. She’s my family’s heart, the engine room that keeps all of us functioning, and in difficult or stressful times (for example when I have a looming deadline and I’m only half way through the book) she has made all the difference. She also tells me that I need to be more like Mark Lawrence. Your books heavily feature battle and combat scenes. Do you think that your father being in the RAF might have had something to do with that? Did he use to share air-force stories with you? I’ve never really thought about that before, but the answer is probably Yes. My dad was shot once, through the stomach. He was in Cyprus and driving a school bus that was under military protection because of the Greek-Turkish conflict on the island. He was very fortunate to come through that, and took great pleasure in showing me the bullet. I suspect that Sunday afternoons and Movie Time watching films like Spartacus and the Alamo are equally to blame, though I suppose my dad was at the root of that, too. I certainly grew up with a love of the fantastical, the mythological and the historical, and combat tends to feature pretty heavily in all three of those. 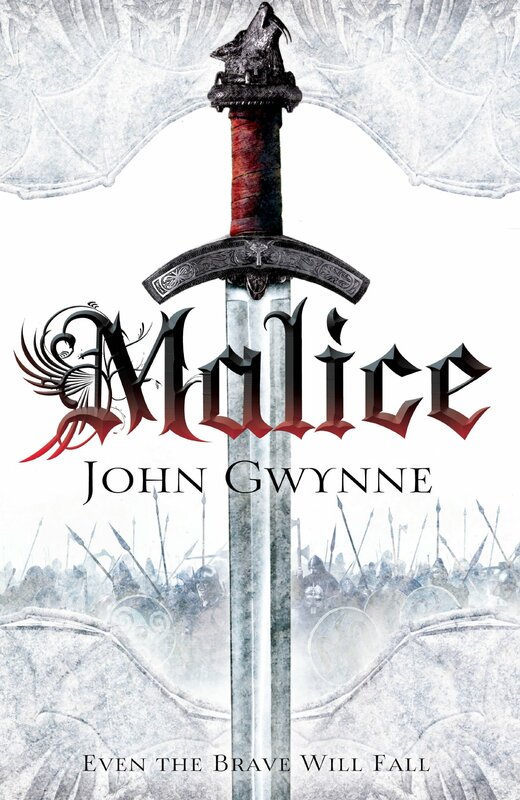 Your first novel, Malice, won the Morningstar Award for Best Fantasy Debut in 2013. I know that you’re a big fan of David Gemmell’s work. What qualities of his writing made him one of your favourite authors? Winning the Morningstar was an awesome moment, made all the better because I was not expecting it. And of course because I am a huge Gemmell fan. I first read Legend in the mid-1980’s. My clearest memory of it is that it was the first book to keep me up reading all through the night, I just couldn’t put it down. That’s what really defines David Gemmell for me. He had that X-Factor ability of combining plot and character with blistering pace. And what characters. Flawed and believable. He still wrote about heroes and courage, about good guys and bad guys, but in a more realistic, relatable way than I had come across before. Last year you finished writing Wrath, the fourth and final book of your first series, The Faithfull and The Fallen. How did it feel to bring this epic series to a conclusion? It’s been quite an emotional experience, finishing this series, one that is still going on as I am just finishing off the edits right now. It does make you sit back and think. The Faithful and the Fallen series has been part of my life for fourteen years now, thinking, plotting, writing, and the characters have entwined themselves into both my own and my families lives. It’s been what I can only describe as bittersweet. It’s amazing to reach scenes that I’ve been imagining for such a very long time, and to be writing the culmination of character arcs that have been going on for years, but it is also sad to be saying goodbye to these characters, and to be approaching the point where it really is The End. My major project is a new series, a trilogy entitled Of Blood and Bone. It has softened the blow of leaving The Faithful and the Fallen, as it is a trilogy based in the same world, taking place a hundred or so years after the events of Wrath. I first saw Mark’s name mentioned on The Wertzone blog back in early 2011, I think. It was talking about Prince of Thorns, and I noticed that Mark and I shared some similarities in that we both had disabled daughters and new book deals. I emailed Mark and we’ve been friends ever since. He’s a top bloke. I read Prince of Thorns as soon as it came out and loved it, course. Mark’s a fantastic writer with many strengths, but what I think sets him apart is his prose. It’s poetic without being wordy or flowery, and has that rare ability to speak straight to the reader’s heart. Do you have any advice for our flash-fiction writing contestants? I’ve never been great at giving writing-advice. I feel like I came to be published through a large dose of good fortune. Really all I would ever say is what worked for me. Lovely guy, awesome fantasy series, and a great interview!